Nava Shoham's use of strong, vivid colors and expressive shapes give her Ketubahs a modern, fiery, and vibrant feel. Get more for your wedding! 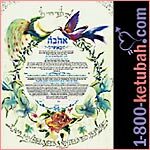 Don't forget to mention ChossonKallah.com when visiting 1800KETUBAH.com.